Promenade Market Tote Pattern - FREE! Denyse's cheater print, Patchwork Promenade from her County Fair line of canvas fabric, is an homage to the American tradition of printed fabrics that mimic the look of patchwork, without the time or effort. A couple of spare bolts in the studio—and some shower time meditation—inspired Denyse's free (!) 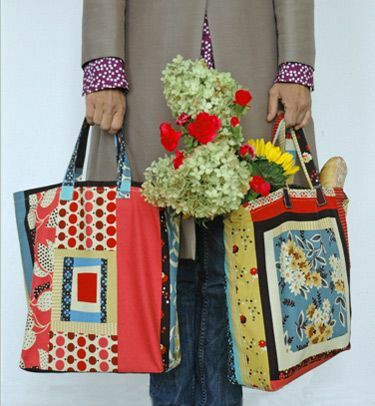 Promenade Market Tote pattern. For just $15 we'll send you enough fabric to make TWO coordinating totes! Lighten up on plastic bags and brighten up your next trip to the market! While supplies last. Sorry, sold out of fabric. Scottie Dog Pattern - FREE! Hope Market Tote Pattern - FREE! All The Trimmings Stocking - FREE! Holiday Hostess Hot Mitt - FREE! The Artful Heart – free! All the Trimmings Scrap Balls – FREE!